Do you have any pain in your hands when you practice or play your guitar? Do you think that playing guitar is hurting your hands? And if you do not feel any pain, what are you doing to make sure your hands stay healthy and functional? In my experience as a musician and teacher I found that many guitar players do not treat their hands really well. Some stress their hands too much, stretch them the wrong way, subject them to needless abuse. Some other simply neglect their hands completely - they just don't know what needs to be done to use their hands in a safe way, so they simply do not do anything and hope they'll be alright. As a result, many guitarists suffer from tendonitis, carpal tunnel syndrome, and other painful conditions. 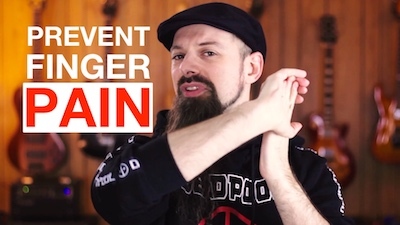 Having done the wrong things in the past and learned at my expenses how to take care of my hands, in this video I show you what every guitar player must do to keep their hands healthy and functional. As you can see those things are super simple to do, require next to no time, and they really do make the difference! I'm not linking to any of my courses today: I do not want this video to be misunderstood or tagged as an ad. The message in this video is very important and I want to make sure that it's clear that my concern is only for your hands' health. ... and until next time... ENJOY!